The estimated lifetime risk of being diagnosed with bladder cancer is 1 in 50 (2%) for males, and 1 in 133 (less than 1%) for females born after 1960 in the UK. These figures take account of the possibility that someone can have more than one diagnosis of bladder cancer in their lifetime (‘Adjusted for Multiple Primaries’ (AMP) method). Sasieni PD, Shelton J, Ormiston-Smith N, et al. What is the lifetime risk of developing cancer? : The effect of adjusting for multiple primaries. Br J Cancer, 2011. 105(3): p. 460-5. Data is for UK, past and projected cancer incidence and mortality and all-cause mortality rates for those born in 1961, ICD-10 C67. 49% of bladder cancer cases in the UK are preventable. Bladder cancer risk is associated with a number of risk factors[2,3]. International Agency for Research on Cancer. List of Classifications by cancer sites with sufficient or limited evidence in humans, Volumes 1 to 122*. Accessed August 2018.
International Agency for Research on Cancer (IARC) classifies the role of this risk factor in cancer development. 45% of bladder cancer cases in the UK are caused by smoking. Higher bladder cancer risk in smokers may partly reflect mutual confounding by occupational exposures. Freedman ND, Silverman DT, Hollenbeck AR, et al. Association between smoking and risk of bladder cancer among men and women. JAMA. 2011 Aug 17;306(7):737-45. Cumberbatch MG, Rota M, Catto JW,et al. The Role of Tobacco Smoke in Bladder and Kidney Carcinogenesis: A Comparison of Exposures and Meta-analysis of Incidence and Mortality Risks. Eur Urol. 2016 Sep;70(3):458-66.
van Osch FH, Jochems SH, van Schooten FJ, et al. Quantified relations between exposure to tobacco smoking and bladder cancer risk: a meta-analysis of 89 observational studies. Int J Epidemiol. 2016 Jun;45(3):857-70. Hemelt M, Yamamoto H, Cheng KK, Zeegers MP. The effect of smoking on the male excess of bladder cancer: a meta-analysis and geographical analyses. Int J Cancer. 2009 Jan 15;124(2):412-9. Brennan P, Bogillot O, Cordier S, et al. Cigarette smoking and bladder cancer in men: a pooled analysis of 11 case-control studies. Int J Cancer. 2000 Apr 15;86(2):289-94. Brennan P, Bogillot O, Greiser E, et al. The contribution of cigarette smoking to bladder cancer in women (pooled European data). Cancer Causes Control. 2001 Jun;12(5):411-7. 't Mannetje A, Kogevinas M, Chang-Claude J, et al. Smoking as a confounder in case-control studies of occupational bladder cancer in women. Am J Ind Med. 1999 Jul;36(1):75-82. Higher bladder cancer risk in certain occupations may partly reflect mutual confounding by smoking. Aromatic amines are used in production of dyes, rubber, and textiles; they are also found in pesticides. An estimated 1% of bladder cancers in males and females in Britain are linked to aromatic amines. An estimated 0.1% of bladder cancers in males and 0.3% in females in Britain are linked to working as a hairdresser/barber. Bladder cancer risk is 29% higher in rubber workers compared with the general population, a meta-analysis showed. Bladder cancer risk is 30-35% higher in hairdressers compared with the general public, meta-analyses have shown; however it remains unclear whether this is limited to hairdressers working before some carcinogenic chemicals were banned from hair dyes in the 1970s. [6,7] This is distinct from domestic personal hair dye use. Bladder cancer risk is 27% higher in leather workers compared with the general population, a meta-analysis showed. Polycyclic aromatic hydrocarbons (PAHs) are formed during combustion of fossil and carbon-containing fuels such as wood, coal, diesel, and fat. An estimated 0.1% of bladder cancers in males and 0.04% in females in Britain are linked to PAHs. An estimated 1% of bladder cancers in males and 0.2% in females in Britain are linked to diesel engine exhaust. Bladder cancer risk is not associated with working in aluminium or iron and steel production, a meta-analysis showed; however there was a suggestion of increased risk. Bladder cancer risk is 31% higher in miners compared with the general population, a meta-analysis showed. Bladder cancer risk is 21-27% higher in mechanics compared with the general population, a meta-analysis showed. An estimated 1% of bladder cancers in males and 0.1% in females in Britain are linked to working as a painter. Bladder cancer risk is 28% higher in painters compared with the general population, a meta-analysis showed. Mineral oils are not specifically classified by the International Agency for Research on Cancer (IARC) as a cause of bladder cancer, however aluminium production is classified as a cause of bladder cancer, and this, along with other metalworking, may involve exposure to mineral oils. An estimated 4% of bladder cancers in males and 0.7% in females in Britain are linked to mineral oils. Brown T, Slack R, Rushton L; British Occupational Cancer Burden Study Group. Occupational cancer in Britain. Urinary tract cancers: bladder and kidney. Br J Cancer. 2012 Jun 19;107 Suppl 1:S76-84. Reulen RC, Kellen E, Buntinx F, et al. A meta-analysis on the association between bladder cancer and occupation. Scand J Urol Nephrol Suppl. 2008 Sep;(218):64-78. Harling M, Schablon A, Schedlbauer G, et al. Bladder cancer among hairdressers: a meta- analysis. Occup Environ Med. 2010 May;67(5):351-8. Takkouche B, Regueira-Méndez C, Montes-Martínez A. Risk of cancer among hairdressers and related workers: a meta-analysis. Int J Epidemiol. 2009 Dec;38(6):1512-31. Rota M Bosetti C, Boccia S, et al. Occupational exposures to polycyclic aromatic hydrocarbons and respiratory and urinary tract cancers: an updated systematic review and a meta-analysis to 2014. Arch Toxicol. 2014 Aug;88(8):1479-90. Manju L, George PS, Mathew A. Urinary bladder cancer risk among motor vehicle drivers: a meta-analysis of the evidence, 1977- 2008. Asian Pac J Cancer Prev. 2009 Apr-Jun;10(2):287-94. Guha N, Steenland NK, Merletti F, et al. Bladder cancer risk in painters: a meta-analysis. Occup Environ Med 2010; 67(8):568-73.
International Agency for Research on Cancer (IARC) classifies the role of this risk factor in cancer development. 2% of bladder cancer cases in the UK are caused by ionising radiation. Bladder cancer risk is not associated with radioactive iodine treatment for previous thyroid cancer, a meta-analysis showed. Sawka AM, Thabane L, Parlea L, et al. Second primary malignancy risk after radioactive iodine treatment for thyroid cancer: a systematic review and meta-analysis. Thyroid. 2009 May;19(5):451-7. Frank C, Fallah M, Ji J, et al. 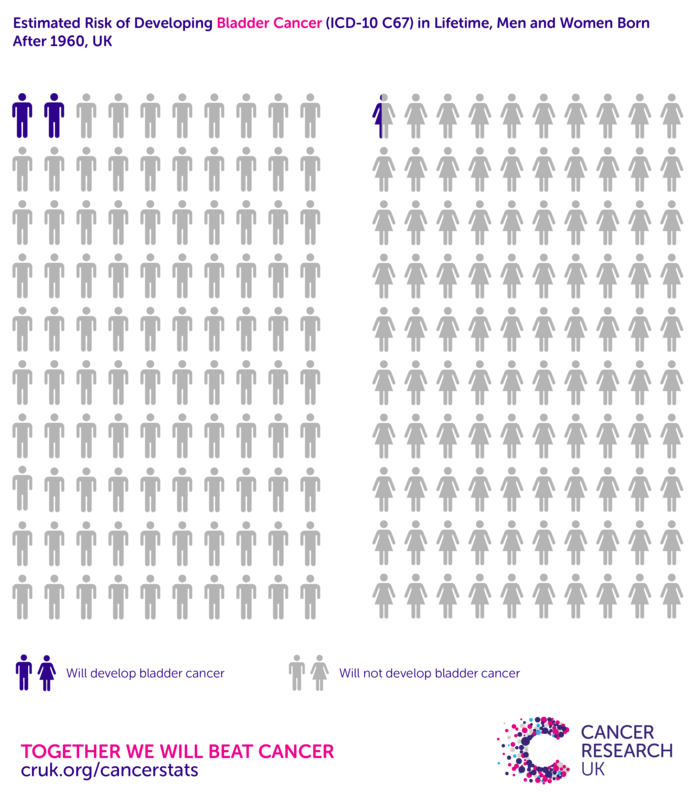 The population impact of familial cancer, a major cause of cancer. Int J Cancer. 2014 Apr 15;134(8):1899-906. Hemminki K, Bermejo JL, Ji J, Kumar R. Familial bladder cancer and the related genes. Curr Opin Urol. 2011 Sep;21(5):386-92. Bladder cancer risk is higher in people with 10μg/L or higher arsenic concentration in their drinking water, a meta-analysis showed; risk increases with higher concentrations. Bladder cancer risk is only increased with high-level, long-term arsenic exposure; an interaction with tobacco use is possible. World Cancer Research Fund / American Institute for Cancer Research. Continuous Update Project Findings & Reports. Accessed September 2017. Saint-Jacques N, Parker L, Brown P, Dummer TJ. Arsenic in drinking water and urinary tract cancers: a systematic review of 30 years of epidemiological evidence. Environ Health. 2014 Jun 2;13:44.
International Agency for Research on Cancer. Monographs on the evaluation of carcinogenic risks to humans, vol 100C. Arsenic and arsenic compounds Available from http://monographs.iarc.fr/ENG/Monographs/vol100C/. Accessed April 2014. Tsuji JS, Alexander DD, Perez V, Mink PJ. Arsenic exposure and bladder cancer: quantitative assessment of studies in human populations to detect risks at low doses. Toxicology. 2014 Mar 20;317:17-30.